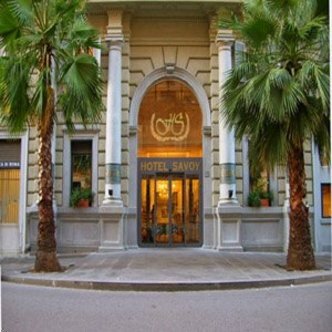 With its superb location, just off legendary Via Veneto in the heart of town, a few minutes walk to the Spanish Steps, the Borghese Gardens and Gallery and the most famous Italian Fashion shopping district, the Hotel Savoy is a traditional, recently renewed, historical hotel with elegant decors and modern facilities. Each of the 135 guestrooms are classical in style and extremely comfortable. All have satellite television, mini bar, radio, hairdryer, safe deposit box, air conditioning, direct dial telephone, smoke detectors and electronic lock on the door. The Hotel*s conference facilities can accommodate up to 180 people. Five conference rooms are available for cocktails, meetings, galas and exhibitions. Audiovisual equipment available, overhead projectors, paper boards, slide projectors, screen and podium. The Hotel Savoy also has an American Bar, an art-deco style Caf&eacute and the Sistina Restaurant which serves a la carte Mediterranean menu and a wide selection of the best traditional Italian wines. Other amenities include concierge, 24h room service, laundry service, multilingual attentive staff, free daily newspaper, internet connection, public transportation at walking distance.